I’m pretty sure that you don’t think your dog is a robot but are you aware of how many things can affect them and in turn, the way they behave? Our moods and behaviours can be influenced by many things and so it is for our dogs, and like us, some are more sensitive than others. 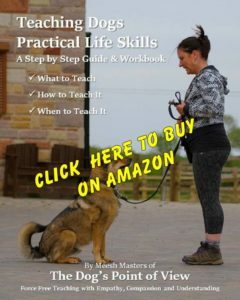 This months article is an excerpt (with some additional info added) from my Teaching Dogs Practical Life Skills A Practical Guide & Workbook which is available to buy on Amazon and is something I’ve been discussing with quite a few clients lately so I thought it might be helpful to share the information with others here on the website. 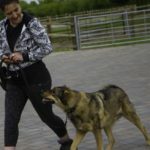 Whether your dog is generally well behaved or you’re experiencing a few challenges with their training or behaviour, it’s always worth knowing and remembering there are lots of things that can have an impact on your dog’s behaviour, as well as their ability to learn and respond reliably. Sometimes, even when a dog does know something very well and is usually excellent at responding to you, there can still be times when their behaviour might not be as reliable as normal. This list is just some of the things that can have an effect and some suggestions for what you can do to lessen the impact. Remember, every dog is unique, and some can be affected by things more than others and at different times, just like we can. Stress can affect a dog’s ability to concentrate and learn but also their general behaviour in a variety of ways, there’s more detailed information on this in my book and in an earlier article here on the website called Stress in Dogs – Is it Causing Your Dog’s Behaviour Problems. Be sure to address the underlying cause of the stressors rather than simply addressing the behaviour you’re seeing. For example, your dog may be pulling badly on the lead because they get anxious when out on walks. You could spend a lot of time trying to teach them how to walk nicely on the lead, but they could struggle to learn and make progress if you don’t address the anxiety that’s causing the behaviour. In order to reduce stress or anxiety levels, you may need to alleviate pressure if you’re training, break an exercise down into smaller chunks, manage either the environment, your dog or both. You may need to provide your dog with additional support in terms of space and the freedom to choose whether they interact or not within a situation, or it could simply mean they require more enrichment suitable to their character or a structured programme of confidence building exercises. If you’re not sure whether your dog is getting stressed or anxious, please seek the help of a positive reward based professional to help you get started while you learn to spot the signals. 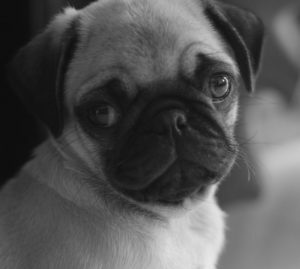 I know this seems one pretty obvious, but you would be surprised at how many new puppy owners are unprepared for ‘puppy’ behaviour and deem it ‘bad’ behaviour, when in fact it is simply a puppy being a puppy and learning about this strange human land they live in, where things don’t always make sense to them. It’s our duty as their guardians to not only teach them but teach them in a way that makes sense to them and their particular needs. Puppies, adolescents or older dogs can all behave, learn & respond differently at times. Puppies obviously have a LOT to learn about living in our human world. They have short attention spans, can be fearful of strange experiences, and just like children can become overtired and hyperactive with too much stimulation and not enough downtime. Adolescent dogs are the age group that in my opinion, the majority of people who get a dog are not only unaware of, but also unprepared for. This is potentially why a very high percentage of dogs surrendered to rescues and shelters are between the ages of 7 and 18 months. Adolescent dogs are very busy transforming from puppyhood to adulthood and have a lot going on both physically and mentally. They can become absorbed in the environment and appear to forget things they have learnt. They can also seem unable to concentrate at times, especially out in the big wide world full of sights, sounds and those all-important smells! Adolescents also go through sensitive periods between the age of around 6 or 7 months right through to 18 months or so (also known as fear periods), and during these times how they experience and perceive the world can change, which can impact on their behaviour. They are also similar to human adolescents in that they can tend to push boundaries, ‘act up’ and revel in being cheeky (some would call it naughty, but it’s usually a lot of high jinks). 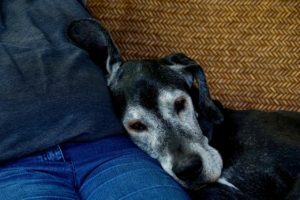 If you have a dog that is getting older in years, they can be experiencing discomfort or pain that you may not be aware of and that can certainly have an impact on behaviour. They can also, like us, want more space and less fuss as they approach their senior years. This can be displayed as ‘grumpiness’, but if you know your dog well and can read their communications effectively, most of these situations can be easily managed and therefore major problems avoided. No matter what age your dog is, if their behaviour seems challenging, have patience, understanding and an awareness of any other contributing factors listed here. Take a moment to look at the big picture and don’t just assume it’s your dog misbehaving, being aggressive or just plain disobedient. All dogs are different and unique, just like us. Parentage, breeding, inherited character traits & genetic hardwiring can all have an effect on how well your dog learns, adapts, copes with & handles life in the human world. Know the typical character traits of your particular breed and take into consideration where your dog comes from so you can play to their strengths and natural abilities within their education and day to day life. The more you can provide the lifestyle and enrichment that suits your particular dog, the less likely you are to encounter problems. Although once you have your dog, it’s a little late for me to tell you things like if you want a reliable off lead dog with instant recall, avoid getting a husky or if you choose a high energy working spaniel type, it’s unrealistic to expect them to cope with being home alone all day. 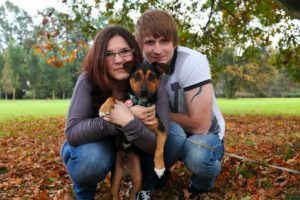 What I can say, however, is love the dog you have and adapt their life to suit them as much as possible, whilst at the same time addressing any issues as best you can. Again, this is something that most people will realise and take into account but often in my work, I find it can sometimes be forgotten as a contributing factor or at least the degree to which it can have an impact not appreciated. As you may or may not know dogs learn by association and consequence and it doesn’t take much for bad things to have an adverse effect on their behaviour, but equally so, good things can be promoted to help overcome the effects of negative experiences. Once again, as with humans, if there has been any historical emotional trauma, this can leave an imprint that can last the rest of the dog’s life and be difficult to overcome. There are also things like repetition history to take into account when dealing with training and behavioural problems. Let’s say for instance you have a 4-year-old dog that is reactive when they see other dogs out on walks. 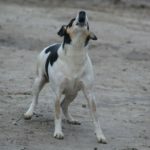 Often reactivity can develop during the adolescent period, if that were so in this case, your dog would have been barking and lunging at other dogs most days of their life (maybe even twice a day) for 3 years. That’s a LOT of repetitions of reactive behaviour. In this kind of scenario (and the same applies to any behaviour that has been happening for some time), you may have to create positive associations and consequences far in excess of the number of negative repetitions already practised, before you see any long-lasting progress. These kinds of problems are probably something you would benefit from professional assistance with rather than trying to fix by yourself. A dog’s first language is body language and energy. They are adept at reading us and our body language, they know instantly when our moods change when we’re not focused and when we’re stressed or anxious, but they don’t know why so they just respond to what they feel. If things don’t seem to be progressing with what you are teaching, or if behaviour problems don’t seem to be improving, take a moment to consider how your behaviours may be influencing a situation before assuming your dog is being stubborn or not listening. 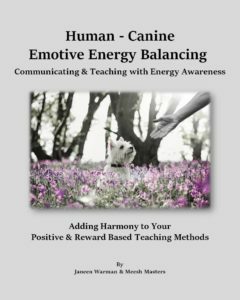 On a positive note, we can help our dogs enormously by consciously altering our behaviours and emotions to help influence theirs. It may seem insignificant, but the weather can certainly have an impact on your dog’s behaviour. Rain, cold, heat, fog and wind can all affect how dogs feel and the look of the environment around them, which can subsequently affect their behaviour and responses. Wind, which can often be unsettling to dogs in terms of affecting their hearing and by creating a lot of startling, swirling and strangely moving objects (think leaves, plastic bags, rubbish blowing around). It can of course also carry smells a lot further, causing additional unseen distractions, especially to the hunting/scenting breeds. Extreme heat or cold can affect how your dog feels in general, which in turn can affect their behaviour, and of course, some dogs find walking in the rain unpleasant, to say the least. Fog is often something that can cause unexpected people and objects to appear out of nowhere, and make things that wouldn’t normally concern your dog look strange and unfamiliar. 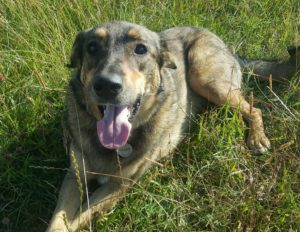 Many dogs are quite unfazed by changes in the weather, but it’s worth remembering how the weather conditions might be having an impact on your particular dog and adjust things accordingly. Who is on a walk can also change how your behaves, both positively and negatively. If a dog is normally walked by one person, and then children join the walk, you could find your dog is more excitable and less responsive to requests. 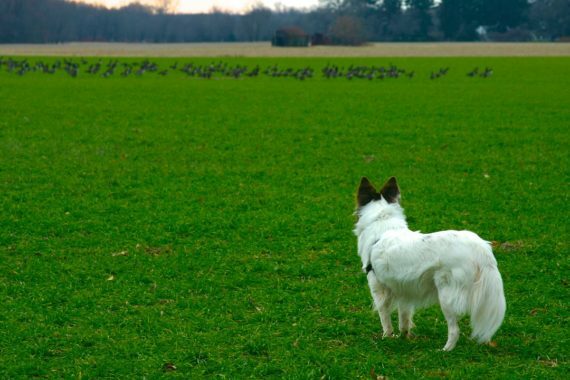 If you normally walk alone but then have a friend join you and you’re distracted because you’re chatting, you could find your dog being less connected than normal, or seems to have forgotten how to do some things they usually do well. This is all perfectly normal (think kids acting up when people visit) and usually just takes a bit of additional attention to teaching, or the implementation of some management to help reduce the degree to which your dog becomes excited, stressed or just simply disconnected from you. 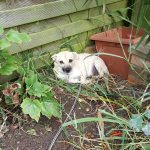 Familiar locations can feel safer, meaning your dog may be more inclined to travel further from you OR familiar locations could be less interesting, meaning you are more interesting to them so they stick around more. On the other hand, new locations can be exciting, meaning your dog could be very distracted and disconnected from you, OR they could feel insecure and uncertain, and therefore more likely to stick close by and look to you for confidence and reassurance. Again, every dog is different in how much or how little they may be affected by changes in location, but usually most dogs, especially from a learning point of view, will find it harder to concentrate in a new location, so take that into consideration with your training and adjust accordingly if necessary. For example, your dog has a reliable recall at your daily walking location, but when you go somewhere new they don’t respond so well. In this scenario you may need to keep them on lead for a while when you arrive, to allow them to familiarise and settle down, you may need to integrate short bursts of off lead play with being back on the lead for engagement activities, to help prevent them disconnecting from you completely and not listening. Many dogs, especially adolescents, once a certain distance away from you can become detached and less likely to respond to you and anything you may ask them to do. Many dogs get lost in their own minds when busy running, sniffing and snuffling out on walks, and we fade into the background. The problem with this is, in the event of them having to make a decision about how to behave or react in a situation that may present itself, they will act instinctively without your input because you’re too far away to play a part in that decision-making process, or to intervene. Through daily interactions and engagement focused exercises we can encourage our dogs to remain within a certain distance of us and connected to us, thereby eliminating this disengagement. Without the necessary teaching rehearsals in the presence of distractions, our dogs can find it difficult to stay focused and listen to us. 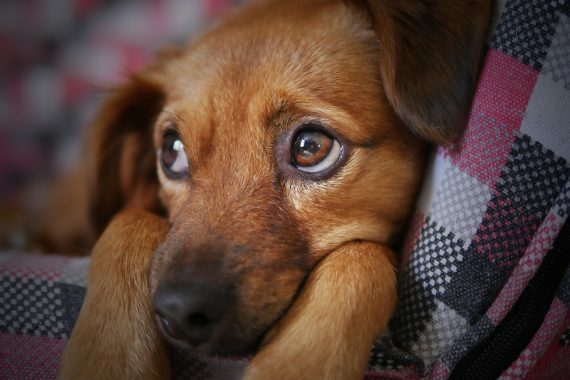 With situations involving triggers, for example, things that cause our dogs to become fearful, anxious or reactive, they can struggle to learn and respond at all. You wouldn’t rehearse for a play or dance recital in front of a theatre full of people, you first learn your words or steps, then practise them over and over. Then you might present them to a small group before you feel you are good enough and confident enough to take centre stage in front of your audience. Dogs are no different, they need to learn the skills required to help them deal with a distracting, tense or emotional situation in the absence of those triggers first. They need to practise those skills often so they become fluent and natural, and then they can start to be gradually exposed to their distractions and triggers, once they reach an appropriate level of confidence and ability. Again, these types of problems are usually best handled with the help of a professional to set you both up to succeed. It is a sad fact that many dogs are handed over to shelters because their behaviour has become ‘unwanted’. 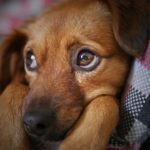 Sometimes it’s because they no longer fit into people’s lifestyles, or are too problematic for them to deal with on a daily basis, but with the right help, guidance, support and management strategies it is usually possible to find a balance that doesn’t impact negatively on either your lifestyle or your dog’s quality of life. Whilst it’s true that could take some time, and possibly a degree of financial investment in getting professional help, I believe our dogs deserve that. 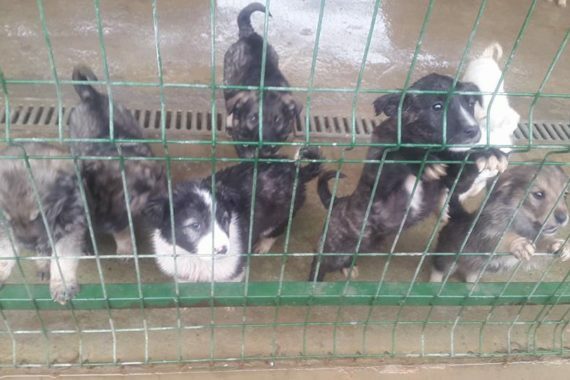 They don’t ask to be chosen by us, they don’t have much of a say in the lifestyles they lead with us, they can’t help that they don’t like being left alone, or are anxious meeting other dogs, or find busy traffic flooded street walks overwhelming (or whatever the issue is) and just like the rest of us, they deserve to be loved and supported for who and how they are. We are none of us perfect. They too deserve to be provided with the education and support they need to be the best version of themselves, so they can be happy, confident and relaxed in their day to day life in our human world. why not share it with your friends and family so they can too. Meesh, thank you for the reminders – we now have 6 month old standard poodle girl, Milly, who forgets she is not a tiny puppy but rather a large, long legged girl when she tries to climb on my lap for a cuddle.She is into everything she can reach, forgets what no, leave, sit, down, stay means when she is in adolescent mood – so maddening —- and then you see her run, as fast as she can, gracefully and so full of life with other dogs in the park , behaving like the puppy she still is , down, tail wagging asking to play , sitting beautifully if a treat is in sight . 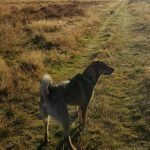 And she and Molly , our Romanian girl play well together – Molly, more lazy, lying on her back or tummy and Milly standing towering over her both tugging away , play fighting – .and we realise we have all ( including you with your advice!) actually accomplished quite a lot between us.